Taking a photo shoot at the TNT Old Time Photo is one of the most unique activities in Branson that will give you memories and make you travel back in time as you pose with the backgrounds of the themed photo shooting venue. If you wanna have a blast in the past, come to TNT Old Time Photo in Branson and experience a memorable moment that will last forever. The motto “Havin’ FUN” of the TNT Old Time Photo is all about enjoying yourself with your family or friends. Your time with the TNT Old Time Photo is going to be more comfortable and provides more fun too which goes hand in hand with the taking of unique photos from the old times. Step back in time as you pose at the TNT Old Time Photo and reminisce the good old days. As you try to pose for a unique photo shoot, you will be provided with spectacular costumes that will really entertain people of all ages. The sets are magnificent, the props are amazing, and the staffs are ready to share with you some fun. Whether you visit the place by yourself alone or with the whole family, you will be provided with the Best Photography that you haven’t been seen before. TNT Old Time Photo offers a vast selection of costumes which are beautifully designed to fit all shapes and sizes. A memorable photo shooting experience for all ages is guaranteed! TNT Old Time Photo in Branson is a family owned and operated business and they just love capturing images on special moments and perfectly making the final touch that will surely give you an unforgettable photo shoot experience. The team will do everything with their expertise and ability to make the unique and amazing photo shooting create an unforgettable experience. From the moment you embark to the photo shoot, you will feel the energetic and excited members of the TNT Old Time Photo Shoot team making your group enjoy the shooting with great fun and excitement. The studio has the availabilities of costumes for all shapes and sizes. Professional and well experienced photographers are always available to make unforgettable photo shooting memories that will last a lifetime. If you only want to take a photo of yourself in front of the wonderful sets without the costumes, you will still be accommodated. Photographers will always go the extra mile for everyone. 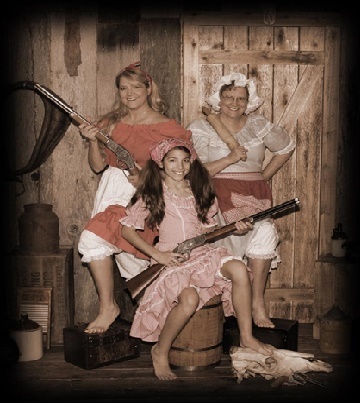 If you are ready to experience photo shooting activities in Branson, you can choose your favorite era – Southern Belle and Southern Genera, Wild West Saloon Girls and Cowboys, Roarin’ 20’s Gangsters, Flapper girls, or Hilarious Ozark Hillbillies. Photos are well edited to give you the best possible quality prints. Prints can be done in less than a minute and are some of the highest qualities on the market. So, if you are looking for a studio that can make the best portrait photos ever, look no further, visit the TNT Old Time Photo Shoot studio in Branson.